On January 25th of this year Sheriff Penzone surprised the entire Posse program membership by temporarily suspending the enforcement operations of the Posse program. The Sun Lakes Posse has continued to provide our medical equipment service program during this suspension. We anticipate our members being cleared by the Sheriff’s Department under the new standards and may resume our patrol functions under the MCSO Posse program by the end of March. In addition to this, expect your Sun Lakes Posse to expand our presence in the neighborhood via the internet and social media platforms like “Next Door” immediately. In order to prevent this lack of patrol presence in the future, the Sun Lakes Posse is expanding the volunteer Law Enforcement presence with a new community partnership. In addition to supporting the MCSO Posse program we are also committing to supporting the Arizona Rangers program moving forward. Please visit their website at www.azrangers.us to see more about the rich history of this volunteer uniformed Law Enforcement auxiliary organization that reports to the Governor of Arizona. While the two (2) programs are not connected at all in the command structure or Law Enforcement affiliations, they share many similarities in their volunteer functions, training and certification standards. All Arizona Rangers are in uniform, armed and trained to assist Law Enforcement agencies when called upon. 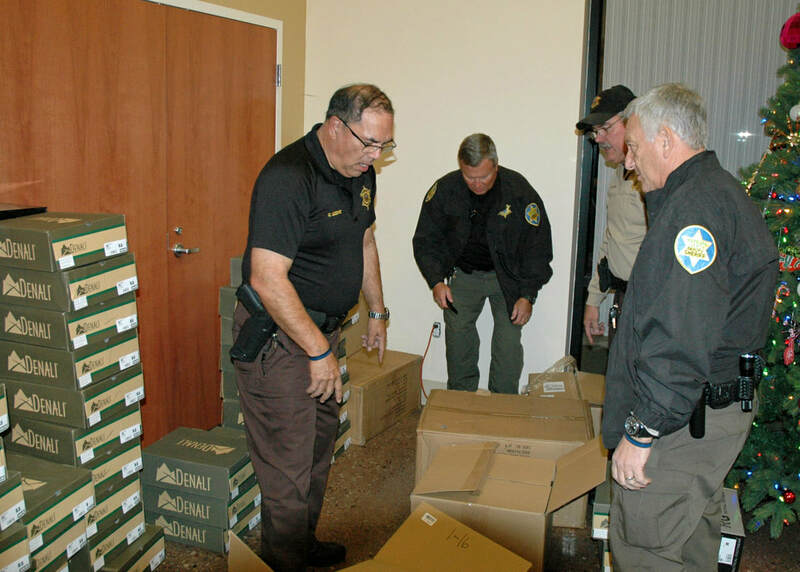 By supporting the Arizona Rangers presence and patrols in Sun Lakes, the Sun Lakes Posse will be able to provide the use of our facility and assets to provide a greater presence than ever before seen in our community. Look for these programs to operate separately and simultaneously in the coming months throughout our community. We are committed to serving the community we live in and call home and greatly appreciate your continued financial support of our expanding operations. In 2017 we donated a bunch of boots and socks to the East Valley Men's Shelter. This year we did it again! They were very grateful. This allows them to gets jobs, some of which require this footwear. On June 27th, members of the Sun Lakes Sheriff’s Posse were invited to speak at the Ed Robson Branch Library in reference to Senior Safety issues. Posse Training Officer Roy Stanifer and Board Member Miguel Romero spoke for roughly 90 minutes on topics such as; personal safety & awareness, home security, vehicle and golf cart safety, fraud prevention, and internet security & internet related fraudulent schemes. Approximately 24 members of our community were in attendance. We are currently in the process of scheduling another presentation for later in the year to reach even more members of our community. Check back on this page or keep an eye out in the Splash and other local publications for the finalized date and time. We hope to see you there. The Sun Lakes Sheriff’s Posse has been invited to speak to the St. Stevens Catholic Church Lady’s Guild this October. We are excited and grateful at the opportunity to meet and talk with members of our community about personal safety and crime prevention. One of our primary goals within the Sun Lakes Sheriff’s Posse is to help prevent you from becoming a victim through education.